Combine shrimp, sriracha sauce, soy sauce, oil and lime juice in medium bowl. Cover and marinate 5 minutes. Cook shrimp in 12- inch nonstick skillet over medium-high heat, turning once, until shrimp are almost pink, about 2 minutes. Meanwhile, prepare Knorr Menu Flavors Sides - Thai Sweet Chili according to package directions. During the last 2 minutes of cook time, stir in peanut butter and shrimp, then pour egg over pasta. Reduce heat to low and cook covered until egg is set and shrimp turn pink, about 2 minutes. 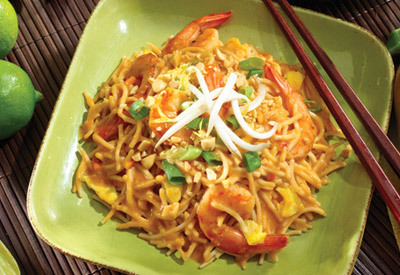 Garnish, if desired, with chopped green onions, peanuts and bean sprouts. Use 1 lb. cut-up chicken instead of shrimp. Be sure to cook until chicken is thoroughly cooked.